Although, we are not in California at the moment, the current San Diego fires hit close to home. 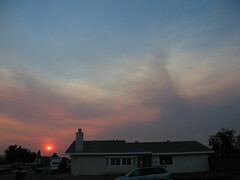 I still distinctly remember the 2003 Cedar fire. This time around it is significantly bigger and by the looks of it already has destroyed the Rancho Bernardo home I lived in while attending SDSU. Miraculously my parents moved out of San Diego last year. Updates are still coming in, but according to this detailed Rancho Bernardo Fire map the house is still standing. Currently, no family members reside in San Diego, but certainly many many friends do. I have been on a few internet chat rooms keeping up to date with friends and old co-workers. It sure is amazingly scary and hope that everyone is doing well. Here are some of the links I have found to be useful to keep track of the fire, in case you are looking for more details. We still have our house in Mira Mesa, but it looks like that is safe for now. Naturally, I am much more concerned about others and friends in the area. I can only imagine that the air quality must be terrible right now. Be safe everyone and please ping me to let me know that you are doing okay.